For close to half a century, AFSA has sponsored a program to recognize and encourage constructive dissent and risk-taking in the Foreign Service. This is unique within the U.S. Government. The Director General of the Foreign Service is a co-sponsor of the annual ceremony where the dissent awards are conferred. AFSA is proud to have upheld the tradition of constructive dissent for these many years, and we look forward to our ongoing role in recognizing those who have the courage to buck the system to stand up for their beliefs. Each year, AFSA calls for nominations of those who have had the courage to dissent within the system, and each October we give out these awards in a ceremony at the Department of State. The F. Allen “Tex” Harris Award for a Foreign Service Specialist. Click here to nominate someone for the F. Allen “Tex” Harris Award. The W. Averell Harriman Award for an entry-level officer (FS 7-FS 4). Click here to nominate someone for the W. Averell Harriman Award. The William R. Rivkin Award for a mid-level officer, (FS 3-FS 1). Click here to nominate someone for the William R. Rivkin Award. 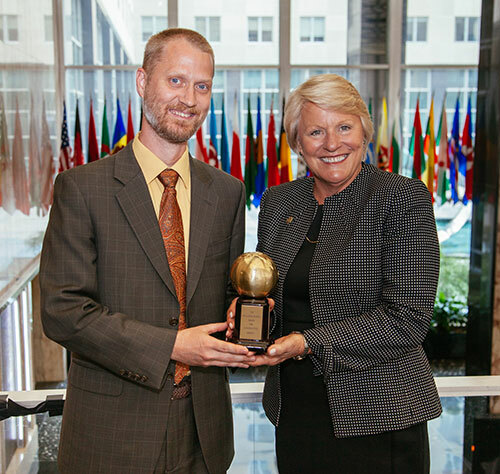 The Christian A. Herter Award for a member of the Senior Foreign Service (FE OC-FE CA). Click here to nominate someone for the Christian A. Herter Award. The dissent awards are overseen by Perri Green, AFSA’s Awards Coordinator. She is available at green@afsa.org and (202) 719-9700. The awards are for Foreign Service employees who have “exhibited extraordinary accomplishment involving initiative, integrity, intellectual courage and constructive dissent”. The awards publicly recognize individuals who have demonstrated the intellectual courage to challenge the system from within, to question the status quo and take a stand, no matter the sensitivity of the issue or the consequences of their actions. The issue does not have to be related to foreign policy. It can involve a management issue, consular policy, or, in the case of the recently established F. Allen “Tex” Harris Award, the willingness of a Foreign Service Specialist to take an unpopular stand, to go out on a limb, or to stick his/her neck out in a way that involves some risk. Nominees may or may not have used the formal dissent channel. Recipients receive a trophy as well as a $4,000 cash prize. Click here to read more about what constitutes dissent. Will Dissenting Hurt My Career? Absolutely not. AFSA has honored dozens of dissenters through the decades, and we would be hard pressed to find one whose career was negatively affected as a result. In fact, many have gone on to long and successful careers in the Foreign Service. A list of past recipients includes such well-known officers as John W. Limbert, Ryan Crocker, Michael Guest, Jeffrey Feltman (currently Under Secretary at the United Nations), Mark Pekala, Thomas Daughton (former Ambassador to Namibia), Thomas Kelly (former Ambassador to Djibouti), Douglas Silliman (current Ambassador to Iraq), Luis Moreno (former Ambassador to Jamaica), Daniel Russel (former Assistant Secretary for East Asian and Pacific Affairs), Frontis Wiggins (former Chief Information Officer at the Department of State) and Geoffrey Pyatt (current ambassador to Greece). For more details on any career implications from dissent, please see Shawn Dorman's September 2013 article on the amazing careers of some of our previous winners, or Francesca Kelly's January 2010 piece from the Foreign Service Journal, "Does Dissent Harm Your Career?" Nominations should be submitted through the AFSA website no later than May 24, 2019. Any questions can be directed to Ms. Perri Green, Awards Coordinator, at green@afsa.org or (202) 719-9700. Nominee’s name, grade, agency and position. Nominator’s name, grade, agency and position and description of association with the nominee. Justification for nomination. The narrative should discuss the actions and qualities that qualify the nominee for the award, with specific examples of accomplishments that fulfill the criteria above. The narrative should not exceed 700 words. Only career or career conditional members of the foreign affairs agencies are eligible to be nominated for an award: i.e. State, USAID, FCS, FAS, APHIS or BBG employees. A person may be nominated more than once in different years for the same award, provided that he/she has never won. The time period during which the actions attributed to the nominee took place does not have to be within the most recent calendar year. However, they should have occurred not more than four years from the time of the nomination. Since the purpose of the Dissent Awards is to encourage Foreign Service employees to speak out honestly and frankly, non-career ambassadors and other political appointees are not eligible for nomination. AFSA Board members may not be nominated for activities while serving on the Board, but may be nominated for any actions which occurred prior to serving, within the time period mentioned in C above. Nominations for any of the awards may be submitted by anyone with knowledge of the nominee’s accomplishments, who does not necessarily need to be a government employee. As noted in part 2 of the nomination guidelines, the nominator must describe the relationship or association with the nominee. Note: The State Department's Dissent Channel and USAID's Direct Channel are unrelated to AFSA's dissent awards. We welcome any discussion and encouragement of dissent within the foreign affairs agencies, but messages sent through these channels will not necessarily come to AFSA's attention unless cited in a nomination.